In Quebec, this week, the province’s Assembly of Catholic Bishops issued a strong statement against the re-introduction of Bill-52, which seeks to legalization euthanasia. Written by the president of the assembly, His Grace Archbishop Pierre-André Fournier, Archbishop of Rimouski, the statement condemns the four parties in the National Assembly for re-introducing the bill, which originally died when provincial elections were triggered earlier this year. “Killing is not care,” said the Archbishop. He said that he understands full well, the anguish and suffering that all experience when a loved one dies in agony. Archbishop Fournier made clear that the answer was good palliative care. He said it is best way to relieve the suffering of people at the end of their lives and to help them live their last moments humanely and with dignity. Recently Catholic News Service had the opportunity to speak with new ordained Dominican priests to discuss ordination. For the last five years Salt and Light has been producing a radio program, hosted by Deacon Pedro called the Salt and Light Hour. 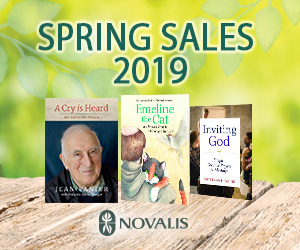 It is the best of Salt and Light: Inspiring messages, insightful interviews, in-depth commentary and music; plus news updates with Alicia Ambrosio, a Saint of the Week with Andrew Santos as well as exciting segments from many outside contributors. The Salt and Light Hour airs on various radio station across North America, including the Spirit Catholic Radio Network in the American mid-west, Holy Family Radio in Northeastern Ohio and the Catholic Channel on Sirius XM Channel 129. Of course, you're also able to stream or download all Salt and Light Hour programs on our website. On last week's show, Deacon Pedro spoke with Cross-Country Ski Olympian, Rebecca Dussault about health, holiness and family and the featured artist of the week was the Catholic band, Out of Darkness. So turn on your radio or visit saltandlighttv.org/radio and listen.